As one of the most complex structures in the human organism, the brain consists of numerous types of neurons that are interconnected in specific orders. These interconnections form the electrophysiological circuit transferring neuronal signals to target areas. Essentially, each “circuit” has a direction for the flow of a signal. In this respect, an in-vivo neural network also has highly ordered neural interconnections. However, the neurons typically cultured in plastic cell culture plates reconstruct a neural network randomly and suffer from experimental limitations. Because the neurons are highly polarized and construct ordered networks, conventional cell culture models in Petri dish present challenges in studying neuron signal transfer. We propose various types of ‘Neural Circuit-on-a-Chip’ which serve as tools for multiple applications, such as in developmental neuroscience, neurodegenerative diseases, electrophysiological, and pharmacological studies. This microﬂuidic platform directs the growth of axons using “neural diode” structures to control neural connectivity. This platform is compatible with live cell imaging and can be used to (i) form pre-synaptic and postsynaptic neurons by directional axon growth and (ii) localize physical and chemical treatment to pre- or postsynaptic neuron groups (i.e. virus infection and etc.). In vitro reconstruction of polarized neuronal networks is expected to be useful in various applications. Because almost all in vivo neural architectures involve biased networks, the microfluidic neural diode platform will be a valuable tool to investigate the molecular and cellular mechanisms in synaptic regions and neural dysfunction. This microﬂuidic platform mimics the 3D architecture of the in vivo neural bundle and axon fasciculation, as well as neural circuits with the hydrostatic pressure to change the cross-linking density patterns of hydrogels. This platform has the structural similarity with intact in vivo brain tissue was established by regulating the cross-linking structures of the ECM components in Matrigel. n this platform, the axon bundle was formed with fasciculation at long distance for 6 d and axons were defasciculated at the terminal of the axon bundle. Furthermore, 3D neural circuits with visualized synapses were also formed and have the ability to propagate sequentially from neural bundles in presynaptic neurons to postsynaptic neurons. This microﬂuidic platform can be used in various neurosciences and also neurodisorder drug research. 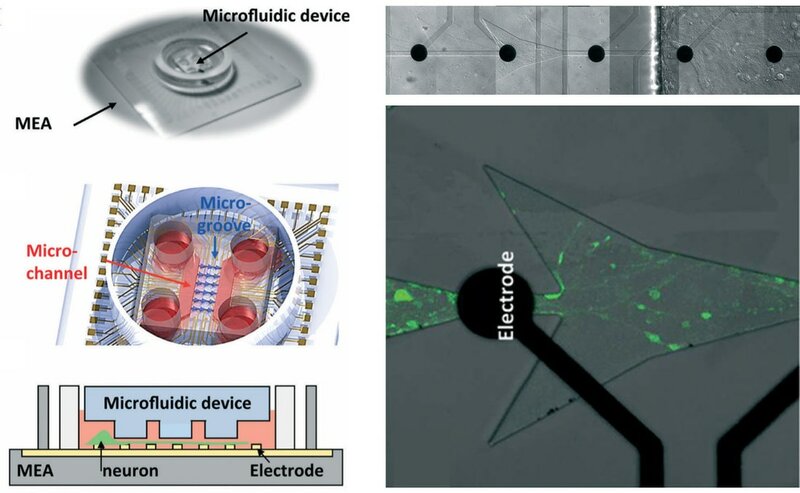 Integration of microfluidic devices with microelectrode arrays (MEAs) has led to investigate neuronal networks using electrophysiological approaches. This platform offers non-invasive, long-term multi-site recording of neuronal networks. Furthermore, unified devices integrating the optical stimulation and the electrical detection in a microfluidic device may expand a wide range of applications. The system could be employed to measure neural response, with imaging its morphology at the same time when neurons are stimulated optically. The neurovascular unit (NVU) interacts between complex capillaries, astrocytic endfeet, pericytes, and neurons. And the blood-brain barrier (BBB) is a part of the NVU. Structurally, BBB has direct contacts that astrocytic endfeet anchor basal lamina of capillary wall composed of a single layer of endothelial cells. Functionally, BBB has low permeability restricting the material transfer to the brain tissue. The researches on neuropharmacology have lower progression than pharmacology of other tissues because of the BBB which blocks the drug delivery to neuron and synapse. In vivo-like in vitro NVU platform may promote research on brain disease model.